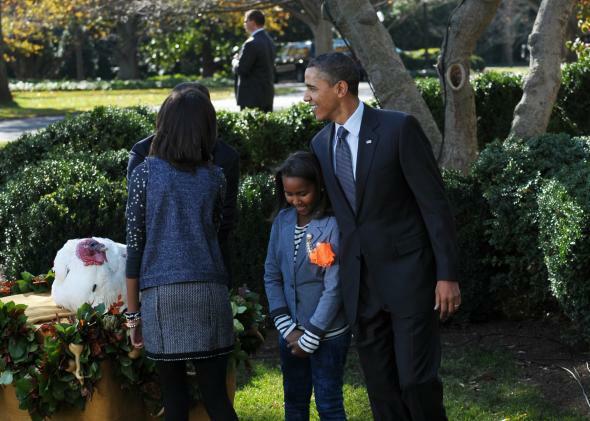 Presidential Turkey Pardon: Obama is more likely to pardon turkeys than people. President Obama pardons two nonhumans in 2010. Most national reporters are all but checked out on Thanksgiving week, having returned to their families in Real America. For those unfortunate few who are on the job until Thursday (ahem), most are content to file on the presidential turkey pardon and call it a week. I had the honor of covering the illustrious turkey pardon for NPR last year, but I was much prouder to help Ari Shapiro report on his excellent story about pardons under Obama. The Obama administration’s ratio is much better this year—now more than 1 in 35 pardons are granted—mostly thanks to a slew of 17 pardons granted after the election was over. And an estimated 46 million turkeys are killed every year for Thanksgiving, so the pardon ratio of 1 in 23 million is admittedly worse for turkeys than for people, statistically speaking. But guess what: Last year’s pardonees, Cobbler and Gobbler, are already dead. Turkeys don’t have as long of a lifespan as humans, nor do we normally put such a premium on a turkey’s life compared with another human’s life. And while it may not make for as good of a pre-holiday photo op, returning a father to his family’s dinner table after serving years for a crime he’s been exonerated of, or the friend who’s been languishing in a jail cell for 33 years, may be just as newsworthy. Anyway, back to what really matters: Are you #TeamCaramel or #TeamPopcorn? *Correction, Nov. 26, 2013: This post originally misstated the number of applicants for commutation as 5,370.